West	of	House	You	are	standing	in	an	open	field	west	of	a	white	house,	with	a	boarded	front	door. There	is	a	small	mailbox	here. This	is	a	small	room	with	passages	to	the	east	and	south	and	a	forbidding	hole	leading	west. Bloodstains	and	deep	scratches	(perhaps	made	by	an	axe)	mar	the	walls. A	nasty-looking	troll,	brandishing	a	bloody	axe,	blocks	all	passages	out	of	the	room. Your	sword	has	begun	to	glow	very	brightly. Talk to your users like they talk to one another. ๏ Be clear. ๏ Be concise. ๏ Be honest. ๏ Be considerate. ๏ Write how you speak. <label	for=&#34;first_name&#34;>What’s	your	first	name?</label>	<input	name="first_name"	id="first_name"
Without	your	first	name,	I	won’t	know	how	to	address	you. Could	you	please	provide	it? <input	type=&#34;radio&#34;	name=&#34;agree&#34;	id=&#34;agree_yes&#34; value=&#34;yes&#34;>	<label	for="agree_yes"
ALBERT EINSTEIN It can scarcely be denied that the supreme goal of all theory is to make the irreducible basic elements as simple and as few as possible without having to surrender the adequate representation of a single datum of experience. ALBERT EINSTEIN (VIA ROBERT SESSIONS) Everything should be as simple as it can be but not simpler. THIS IS REAL COPY Heavy rains throughout most of the State have given an optimistic outlook for lessened fire danger for the rest of the season. However, an abundance of lightning maintains a certain amount of hazard in isolated areas that have not received an excessive amount of rain. IT COULD BE SO MUCH BETTER Heavy rains throughout most of the State have lessened fire danger for the rest of the season. However, lightning threatens isolated dry areas. The	top	seller	in	the	garden	department	is	Repel	Lemon	Eucalyptus	Natural	Insect	Repellent,	4-Ounce	Pump	Spray	Would	you	like	to	hear	the	rest? 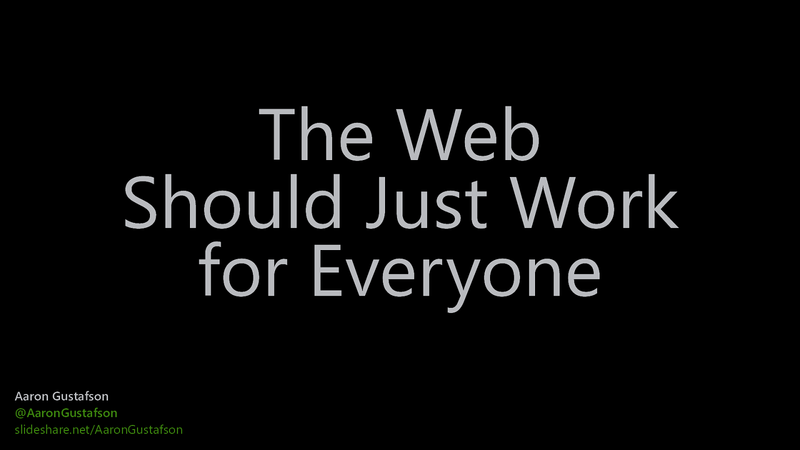 View The Web Should Just Work for Everyone on Notist. In this session, Aaron Gustafson will talk about what it means to be accessible, where disabilities occur, and how addressing those disabilities creates opportunities for our work to reach and empower more people.